Everyday Beauty: Valentine's Day Greetings! Happy Valentines's Day everyone! 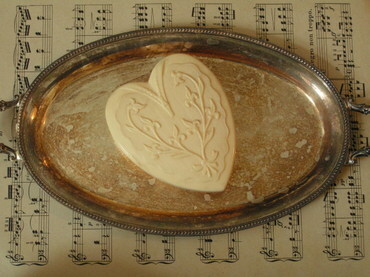 This morning, I walked around the house and found all things heart-shaped to offer as my Valentines to you. Here's an old celluloid box I found at an antique store. A pillow I got many years ago because I just loved it. Not really my color, but it's beautiful. The lace is so soft after decades of use. Right now, it sits on the guest room bed. Also some old brooches, necklaces and earrings to adorn it for now. 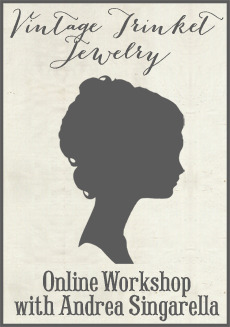 The long pewter-looking necklace is actually tarnished silver. Click the picure to enlarge it. My great-uncle brought this back from Peru for my mother when she was a little girl. He was in the military.....the Navy, I believe. The Peruvians made this by hand, and the workmanship is so delicate and incredible. And a covered box of chocolates I made just for you! I admit the chocolates are all gone now..... Well, a girl's gotta eat while she creates! 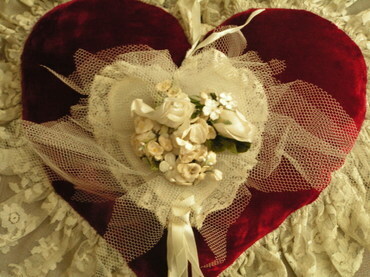 I wish you lots of love today! Love all these hearts! Especially the box that you made. I loved seeing all the heart-shaped pretties you found! So many beautiful hearts!!! Thank you and Happy valentines Day to you!!!! Love them all. You box is scrumptious! 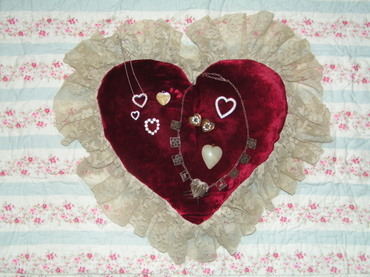 The top heart is my favorite with the scalloped edges and lace. Oh! 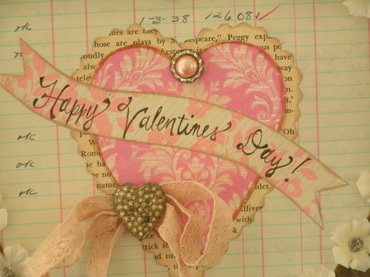 Andrea, I absolutely adore that valentine box that you made, it is gorgeous!! Your collection of hearts is just wonderful. I especially like the one you created. Note to self.....eat chocolate while creating. I like it! what a lovely, heart-filled post. everything is beautiful! i'm typically not a heart person. as a matter of fact, as i was purusing your hearts, i wondered... if i had to search for a heart in my house, could i find one? thanks for sharing these beauties, for those of us who forget how lovely they really can be. (I'm a tad late...sorry!) But Happy V-Day anyway! Just found your blog...it's fabulous!!! Thanx for all the eye candy! Finally able to post!! Type pad has not been too nice to me lately!! 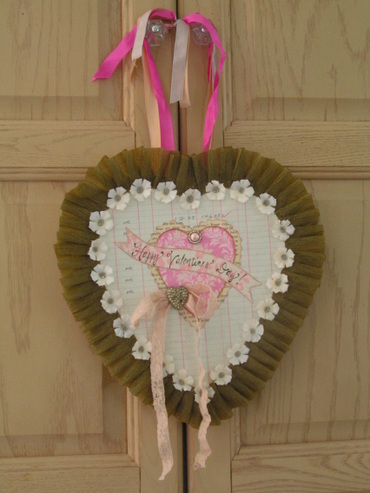 Your Valentine creation is just beyond perfect! I adore it to bits!! So so lovely!! Hope your Valentine's Day was as sweet as can be!! silly andrea... ethyn is my grandson!!! but then again, how would you know, right?? Oh My Gosh! I just found your blog and I love it. Beautiful and inspiring. Come visit me at mine!